How often have you driven south on U.S. 1 and seen the sign designating J. D. Redd Park on the right, just after passing Capital Bank? Did you ever wonder who he was? I had an idea but not much more than that. When I was a youngster, my mother would drop my brother and I off at Mrs. Redd’s day care facility, located at the corner of N.W. 1st Ave. and W. Mowry from time to time. I figured that J.D. Redd was related to Mrs. Redd, somehow, but didn’t know how. 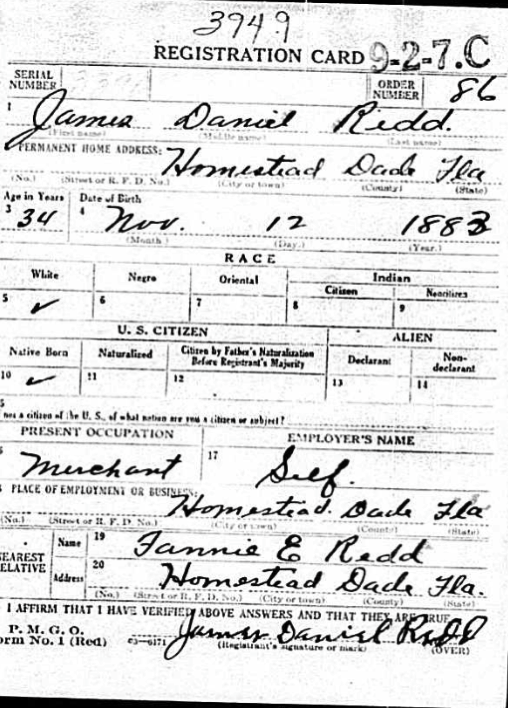 James Daniel Redd was born on November 12, 1883 in Windsor Township, Aiken County, South Carolina. He was one of seven children shown in the 1900 census. Three of those children had left the household by 1900, as the 1900 census shows that James’ parents had 10 children, 10 of which were still living. His parents were Mashack C. (1850 – 1918) and Margaret Annabelle Fouts (1853 – 1927) Redd. They were farmers and James was a farm laborer. Whether his parents owned a farm or not, I do not know. But there were a substantial number of Redds in Aiken County – Redds had apparently been in that area for a long time. James’ father may have been farming inherited land but only deed research would be able to establish that. James Daniel ReddJames married Fanny E. Nottage, who was born in Key West in 1883. From information in the 1910 Key West census, I learned that Fanny’s mother was Marian T. Fleitas, who was born in Florida but whose father was from the Bahamas. It seems as though Francisco Fleitas was Marian’s second husband – she was apparently married to a Nottage first, as Fanny E. Nottage is shown as a “step-daughter” in the 1910 census. Marian’s maiden name was Albury, as her mother, Frances Albury, is also shown in the household. In the April 5, 1912 issue of the South Florida Banner, there is a note that says that “Mrs. F. Feleiter, of Key West, is visiting her cousin, Mrs. W. J. Froedell.” The newspaper writers of that era were no better than those of today! The references are to Marian Albury Fleitas and Maisie I. Parks Tweedell, wife of Walter Jackson Tweedell. On another page of the 1910 census, James appeared as a “laborer lineman” living on quarter boat #5 in the Key Matecumbe District in Monroe County. He was obviously working on Flagler’s railroad. James may have been here as early as 1906, a date given in an article in the April 17, 1942 issue of a newspaper called Community Review touting J.D. Redd as a candidate for the Dade County Commission. James Redd and Fanny Nottage were married in Key West on 20 January 1914 at the Fleitas house at 719 Eaton Street1 when they were both 31 years old. How they met is hard to say, but a possibility is that since Fanny was a cousin of Walter Tweedell’s wife (he married Maisie in Key West in 1904), Marian brought her daughter along with her on her frequent visits to Homestead, where she introduced her to James. 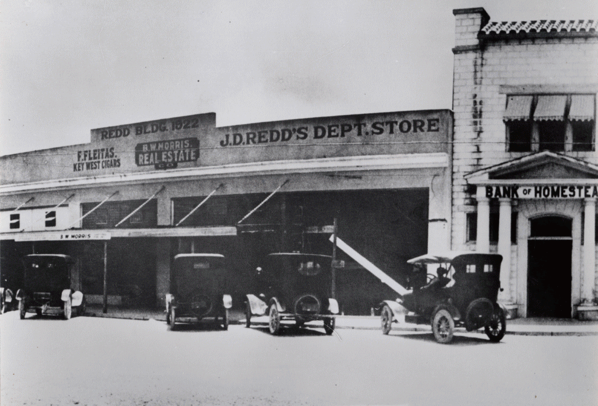 In 1927, Marian’s husband, Francisco, sold cigars from a space in the Redd Building. Note the sign for Francisco’s store on the left side of this photograph. He shared space with Benjamin W. Morris, a prominent realtor and developer. Note who the registrar for the draft board was: Sid Livingston. In the 1920 census of Homestead, Fanny’s parents were living in the Redd household. Francisco was 71 and Marian T. was also 71. Francisco had been born in Cuba in 1859 and was a naturalized citizen of the United States, being naturalized on May 15, 1893. James had two brothers who also moved to Homestead. They were Chester Mashack Redd (15 May 1880 – 9 April 1954) and Frederick Hubert Redd (26 August 1892 – 18 April 1950). According to Jean Taylor, Fred had an Oakland car dealership in Homestead, but in studying the 1927 Homestead City Directory, I could only find an entry for Fred as being a “clothes cleaner” at 10 S. Krome Avenue, next to his brother James’ store, The Men’s Shop, at 4 S. Krome. Oakland cars at that time were sold by the Gordon Thompson Motor Company, at 103 N. Krome Avenue. Gordon E. Thompson was the president and treasurer of the company. If Fred had an Oakland car dealership in Homestead, it remains to be found. Fred was born in Montmorenci, Aiken County, South Carolina and in 1917, according to his draft card, he was an insurance agent for the Metropolitan Life Insurance Company in Charleston, S.C. He was not married at that time. In the 1920 census, he was single and living in a boarding house operated by James and Henrietta Chambliss in Homestead. He was still single. In the 1930 census, Fred and his wife, Othelia, were living with her father, Charles T. Fuchs. This was in the depths of the Depression – times must have been very hard, indeed. Fred and Othelia were married in 1922. In 1910, Chester, James’ older brother, was living with his parents in South Carolina with Katie, the widow of one of his brothers and Katie’s daughter, Thelma, who was only 9 months old, in the household. In 1920, Chester was in Homestead, renting a house, where he lived with his wife, Lottie Pearl Barton Redd and their two sons, aged 7 and 2. In 1930, he was living with his family on N.W. 6th St. and his occupation was given as “truck farmer.” In 1945, Chester’s occupation is given as “laborer” and he was living with his wife and two of his children, Marjory and James. Chester died in 1954 and his widow in 1969. Of the three brothers, James was the most well-known. He was very active in civic affairs and was elected County Commissioner for a number of terms. The answer to the question I posed at the beginning of this post is that the Mrs. Redd who ran the day care center was Fred’s wife. Jean Taylor wrote that James D. Redd met John U. Free while working on Flagler’s railroad in the Keys and that when they came back up to Homestead, they became partners in business. That could be – I don’t know. From what I’ve learned, all three brothers were of humble origins and they worked hard to achieve what measure of success they obtained. None of them homesteaded land here or got any other breaks from the government. James must have been the most skilled in dealing with other people, as he was a successful businessman who was elected to the Homestead City Council in 1913, the year that Homestead was incorporated. He subsequently served on both the City Council and the Dade County Commission. In 1921, Walter Tweedell resigned from the County Commission because of his failing health and Redd was appointed to take his place. Redd was the County Commissioner representing Homestead from 1921 until the fall of 1942, when he lost the election to Preston B. Bird, 13,178 to 16,824. He served continuously except for 1935-36, when he declined to run for re-election due to health issues. He was a member of the Homestead City Council from 1913 until 1935. J.D. Redd died on February 24, 1965 at the age of 81. His wife, Fanny, had died on September 17, 1957. He, his wife, and his wife’s mother, Marion, are buried at Palms Woodlawn. Now, the next time you drive by J.D. Redd Park on Homestead Boulevard, you’ll be able to tell your passengers something about the man for whom the park was named. While browsing old newspapers via Genealogy Bank on various topics related to early Florida City history, I’ve come across the name E.H. Ring on a couple of occasions. Maybe it is people who go by their initials who intrigue me or something else – I don’t know. But I wondered who this man was. When I happened across his name on an early plat in Florida City, I got even more curious. 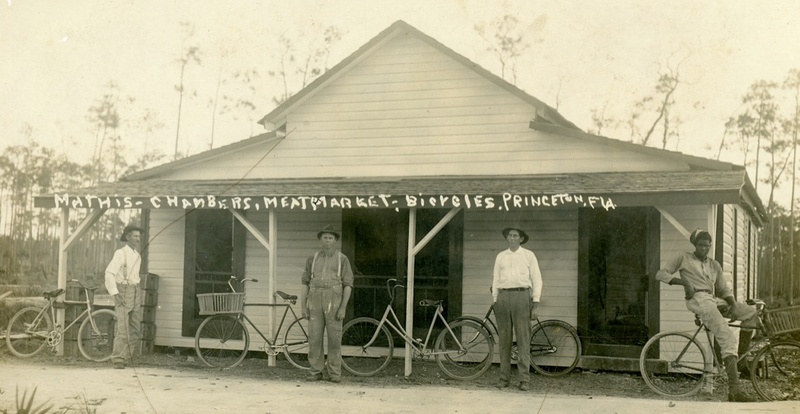 In 1912, he was an election inspector for Precinct 20 – Florida City – and he and his wife’s “old home” was in Virginia. I went to Ancestry to see if I could find him and I did. His full name was Elbert Holmes Ring – no wonder he liked to go by his initials! He was born on November 12, 1867, most likely in Grayson County, Virginia because that is where he, his wife and his daughter are buried, in the Summerfield United Methodist Church Cemetery. In 1900, he had made his way all the way across the continent to Malheur County, Oregon, where he lived in Bully Precinct, with his wife, Mamie D. Querollo. According to a Wikipedia article about Malheur County, it “is 94% rangeland, with the Bureau of Land Management (BLM) controlling 72% of the land.” How a boy from the wooded lands of the Appalachian foothills came to be in the dry rangeland of southeastern Oregon is a story that may never be told. But there he was. On the same page of the 1900 census, another family of interest appears: Charles Becker and his wife, Marie. Charles, whose parents were born in Germany, was born in May, 1841. I mention this man because in the 1910 census, guess who is working for Charles? Yes, Elbert H. Ring and his wife, Cora V. They had been married for 4 years, which corresponds to the Virginia marriage records for the couple: they were married on September 12, 1906 in Grayson County, Virginia. Now, let me add to the story by bringing in a bit about Charles and Mattie Becker from Jean Taylor’s book, The Villages of South Dade. 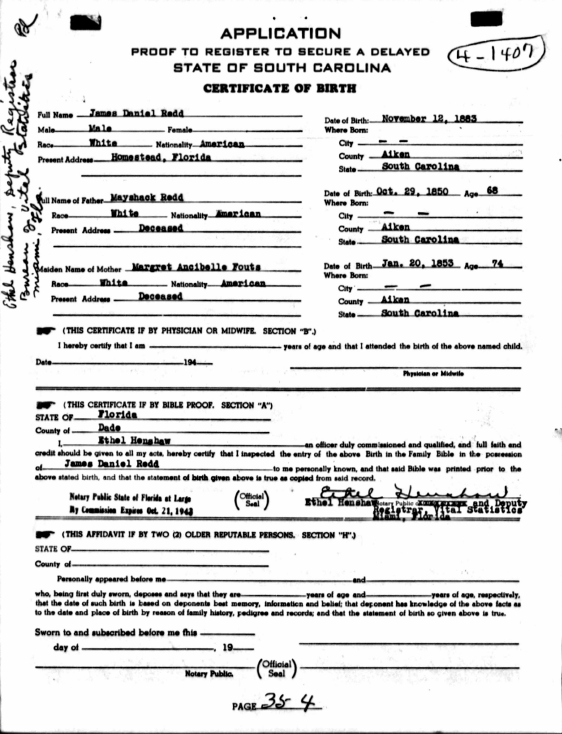 She wrote that in his early life, Charles “ran a cattle ranch in North Dakota and Montana.” That is true – the 1930 census shows his son Lawrence as being born in 1897 in Montana and his son Charles H. as being born in North Dakota in 1902. Was the Charles Becker in Oregon some kind of relation to the Charles Becker in Wyoming, Montana, North Dakota, Canada and California, all places that he lived before ending up in Florida City? Possibly, but I have no proof. Taylor said that in 1914, Becker went to Argentina to find a ranch to buy, cabled his wife to come, got lonely waiting for her and decided to come back to this country. He traveled on a boat to Cuba and from there hopped on a boat in Havana and went to Key West, where he rode Flagler’s new Overseas Railroad into Homestead. He liked what he saw and changed his mind about Argentina, settling in Florida City instead. That’s Taylor’s story, anyway. I don’t know if there was a connection between the Beckers and the Rings or not, but I suspect that there was. In the 1900 census, E.H. Ring’s wife’s name was Mamie. Her maiden name was Querollo and she had been born in Missouri of Italian heritage. In 1900, Elbert, Mamie and Julia, age 5, were living with Mamie’s aunt, Kate Prato, and her uncle, William Fopianno in Oregon. In 1910, Elbert was living with the Beckers in Oregon with his second wife, Cora V.Thomas, whom he married in Grayson County, Virginia on September 12, 1906. Meanwhile, the Beckers who settled in Florida City were in Lemon City, California, in June, 1910. Perhaps they were there while Charles was prospecting for a ranch in Argentina. The family next appears in Miami in the 1915 directory, which was published in 1914. The Miami Land & Development Company advertised their Florida City land heavily in Miami, so perhaps that is how the Beckers came to this area. Perhaps they had kept in touch with the Rings. At any rate, on November 7, 1915, the Beckers moved into their new home, on the south side of the Florida City canal, a few hundred yards east of the pavilion. There may have been a substantial population of Italians in Oregon in the early 1900s but I don’t know. That community may have prompted Charles’ trip to Argentina because people of Italian heritage comprise the majority of the population of Argentina. I don’t know if the fact that Elbert Ring’s first wife was a first generation Italian-American had anything to do with Charles Becker’s trip to Argentina or not, but I suspect that it did. 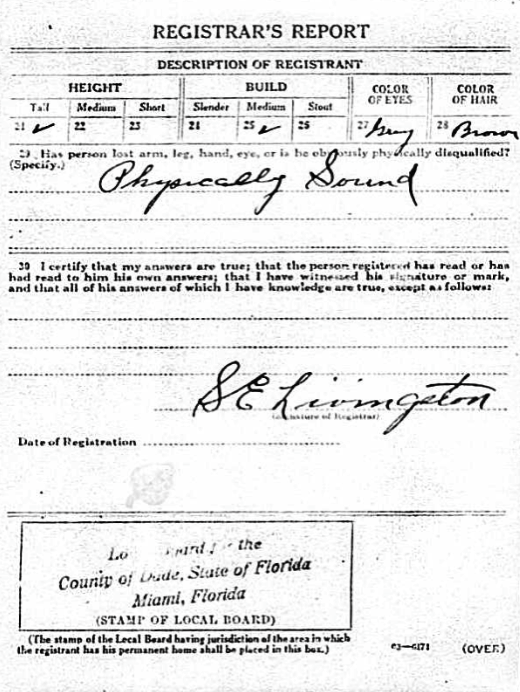 As I wrote earlier, E. H. Ring was an election inspector for an election held in Dade County in the spring of 1912. Mabel Delp Ring, E. H. and Cora’s daughter, was born on February 12, 1913 in Grayson County, Virginia, according to the Ring tree on Ancestry. That may be in error, though, because it is likely that the Rings were in Florida City at that time. If E. H. was working for Charles Becker in 1910 in Oregon and Charles went to Argentina in 1914 before appearing in Miami later that year, it is possible that E. H. and his wife made their way to South Florida, staying in touch with the Beckers as they did. Perhaps he helped convince Charles Becker that Florida City was a better place to locate than Argentina. It’s a little troublesome that Becker would board a ship in Argentina and get off in Cuba. If he was coming back to America, why did he get off in Cuba? It is also interesting that his employee’s first wife was Italian-American. That’s my story. At any rate, E.H. Ring bought some land from the Miami Land & Development Company, and on September 25, 1915, he caused the plat of Florida City Heights (! – Florida City is as flat as a pancake) to be recorded in Book 3, page 211 of the records of Miami-Dade County. At that time, he said that he lived in Grayson County, Virginia. In 1920, he was back in Grayson County, with his wife and daughter. He died in Grayson County on October 19, 1937. It seems that Elbert H. Ring lived an adventurous life. He grew up in the wooded Appalachian foothills, worked on a cattle ranch in Oregon, engaged in real estate speculation in Florida City and then moved back to Virginia, his pockets full of money from the sale of his land in Florida City. I’ve written this post partially out of curiosity about who E. H. Ring was and partially because I’m trying to explain why so very few people know anything about the history of this area. They move away, that’s why. Did E. H. Ring feel any connection to this area? No, not at all. How many of his descendants know that he was in Florida? Very few, if any, I’d wager. So it is for so many people who have floated through this area ever since it was opened for settlement by the construction of Flagler’s railroad. History can’t be told without connections and very few people who now live here have any connection to this area. I am indebted to Ed McMichael for much of the information in this post. Without his help, it couldn’t have been written. Or, perhaps I should say, a much leaner version with much less information in it would have been written. Jean Taylor, in her book The Villages of South Dade, wrote a short piece on Ruf, as he was called, and his family. He was also known as “JR”. In this post, I wanted to create a more detailed picture of Ruf than Jean was able to do in her book. James Rufus Dorsey was born on October 7, 1883 in Lovejoy, Clayton County, Georgia, which had been carved out of Henry County in 1858. The town of Lovejoy was founded on September 16, 1861. James’ great-grandfather, John Dorsey, along with a brother, Frank, had settled in Henry County, coming from Maryland shortly after 1800. Stephen Green Dorsey, one of John’s sons and James’ grandfather, became one of the largest landowners in Henry County and also owned more slaves than anyone else. It shouldn’t be surprising that Stephen Green Dorsey was a judge in Atlanta – prominent landowners often hold important positions in their communities. John J. Dorsey, James’ father, was born in 1850 and died on the 1st of January, 1889, due to pneumonia contracted while helping to battle a fire that destroyed a large portion of the town of Lovejoy. After his death, his widow and her family moved a short distance to East Point, Georgia, which is in Fulton County, where they lived on Dorsey Avenue. James grew up in East Point and apparently had a good deal of mechanical talent because by 1910 he shows up in the census of East Point as a “telephone repairer.” The first telephone company in the Atlanta area had been established in 1879 and by the mid-1880s, the Southern Bell Telephone & Telegraph Co. had been formed. Southern Bell opened a switching office in East Point sometime between 1902 and 1905. Ed McMichael has a photograph of three operators at the East Point exchange, taken on January 10, 1905. One of the operators, Jennie Tom Brown, became James’ wife. A second telephone company, the Atlanta Telephone and Telegraph Co., began in 1899 – the first AT&T, not to be confused with the other American Telephone and Telegraph company (AT&T), which was formed in 1885 as a subsidiary of the American Bell Telephone Company to build and operate a long-distance network. As is often the case, this new upstart grew rapidly and soon overtook Southern Bell in numbers of subscribers. However, that was not to last for very long, as Southern Bell bought out the Atlanta Telephone and Telegraph company in 1919. By that time, James had been in Homestead for at least 6 years. James and Jennie were married in Jacksonville, Florida on August 12, 1909. Since Jacksonville was the northern terminus of the Flagler System and James was an adventuresome young man, he may have decided to head on down to Florida to see what everyone was talking about. This was the time, of course, when Flagler was building his Key West Extension and you can be sure that word of that project was wide-spread. Perhaps he and Jennie were not quite ready for the big move, though, because on April 25, 1910, they were enumerated in East Point, living with Jennie’s parents, Thomas J. and Martha A. Brown. James and Jennie’s first child, James Rufus Dorsey, Jr., was born on November 7, 1910 but died the next day. After settling their affairs in East Point, James and Jennie moved back down to St. Augustine, where their first daughter, Marian Elizabeth (“Mannie”), was born on December 14, 1912. John U. Free and James D. Redd had met while working on the railroad in the Keys but it is unlikely that James Dorsey worked on the Extension. In a short item that appeared in the November 14, 1913 issue of The South Florida Banner, it was stated that “J. R. Dorsey, wife and daughter from East Point, Ga. has been hired by the Dade County Telephone Company as lineman and will be here about the 15th or soon after.” When they arrived, they lived in a rented house that was owned by J. U. Free on what is now N. E. 5th Avenue. The Dorsey’s second daughter, Francis Aire, was born in that house on September 10, 1915. It is not known how James Dorsey came to be hired to work for the Dade County Telephone Company, established in 1911, but there is a possibility that J. R. knew J. U. Free from the time when they both lived in the Atlanta area – before J. U. Free headed south. If J. R. (“Ruf”) had no prior knowledge of a job working for J. U. Free, his experience in East Point surely came in handy, because by September 12, 1918, he was the manager of the Dade County Telephone Company. The Dade County Telephone Company grew to have 380 subscribers by July, 1923, when it was purchased by Frank Shutts, who also owned The Miami Daily Herald in Miami and was the president of Miami’s telephone company, The South Atlantic Telephone & Telegraph Co. The Dade County Telephone Company served the area from Florida City all the way up to Kendal (often spelled with one “l” in those days). James was a man of many talents. In addition to being employed by the Dade County Telephone Company and its successors, the Homestead Telephone Company and Southern Bell, he farmed, bought and sold real estate and managed the Homestead School Bus company that his wife, Jennie, had established in 1923. The company picked up children and carried them to and from Florida City and Neva King Cooper elementary and Homestead High school until the early 1950s. James Rufus Dorsey died on May 10, 1973, at the age of 89. He is buried in Palms Woodlawn Cemetery in Naranja. I will post more about the connections between the Dorseys and other families in Homestead in the future. For now, I want to keep my posts focused on people who settled in this area before 1920. Jean Taylor spent 16 years working on her book, The Villages of South Dade and it is an indispensable book for anyone researching history in this area. Without it, we would have lost a great deal of information about the early history of this area. However, and I’m certain Ms. Taylor would agree, her book, because it is based on oral history, should not be relied upon to provide the definitive answer to any particular question. Instead, it should used as a guide. Today, researchers are blessed with vastly easier access to primary sources and information that Taylor simply had no way of obtaining. She did a wonderful job and provided a splendid introduction to the history of this area, but we, as researchers, need to try to confirm what she wrote. The subdivision that Ms. Taylor refers to is that of J.U. Free’s subdivision of his homestead, recorded in Book 1, page 9. Free’s subdivision was of his entire homestead, 160 acres, and it was recorded on March 2, 1910, before J.U. Free was granted the patent on his homestead on June 13, 1910. That land was subsequently further subdivided, starting in 1913 with Free’s 2nd Addition to Homestead. Earlier, in December of 1910, a Mr. Walbridge had subdivided the 5 acres encompassed by Mowry and N.E. 1st Street and Krome Avenue and N.W. 1st Avenue. Real estate speculation and development was intense in South Dade at that time, something that seems to have continued ever since. As I was browsing through the early resolutions on the City of Homestead website, I came across the name R.F. Tatum repeatedly – he was the first mayor of the Town of Homestead. I had tried to research him before, but hadn’t had much luck. 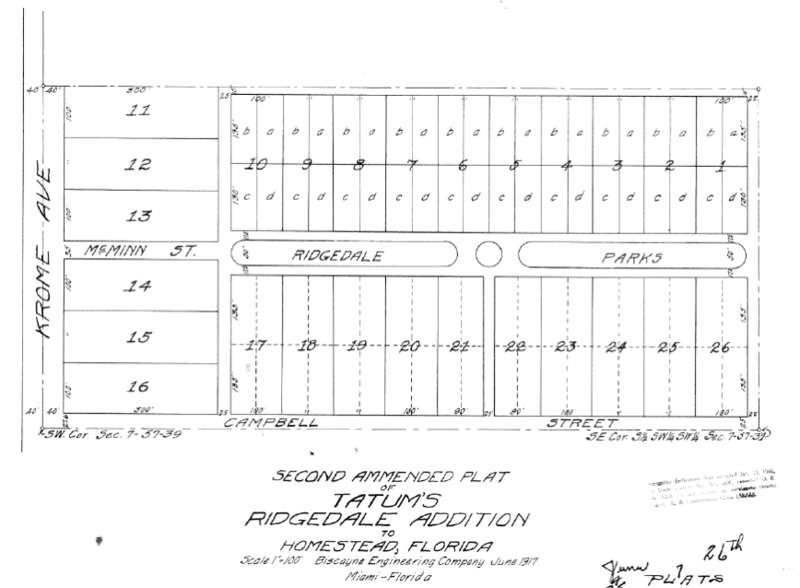 When I looked at the plat of Tatum’s Ridgedale Addition, though, I discovered his wife’s name, Jessie R. That proved most helpful in my research. The plat is dated June 26, 1917. R.F. Tatum’s full name was Russell Fleming Tatum and he was born on January 1, 1878, one of the children of Gaines Webster Marquis Tatum (1852-1930). 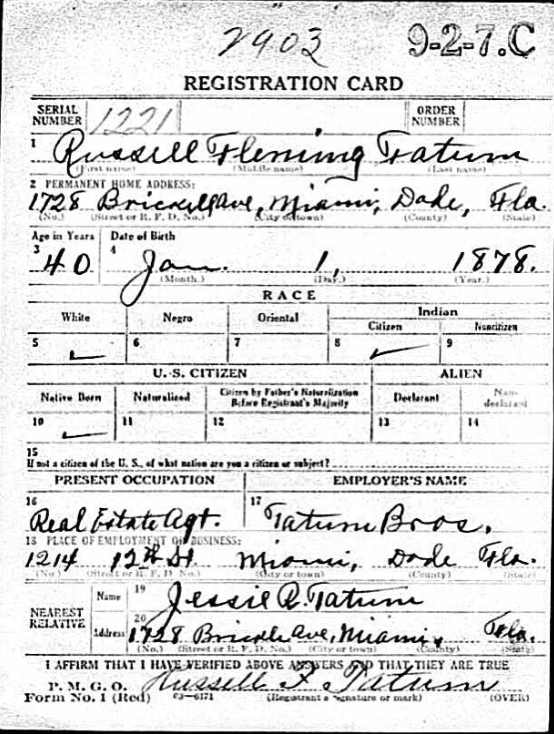 Note Russell’s occupation (real estate agent) and his address, 1728 Brickell Ave., Miami, at the time of his registration, which was September 9, 1918. He had resigned his position as Mayor of the Town of Homestead by this time and James D. Redd was filling the position temporarily. Note also Russell’s employer: Tatum Bros. The Tatum Bros. were Judson H. (1859-1923 – J.H. ), (Bethel Blanton (1864-1943) – B.B. ), Johnson Reed (1866-1938 – J.R.) and Smiley Mosteller (1870-1935 – S.M.) The Tatum Brothers were enormously influential in the development of Dade County. B.B. bought the Miami Metropolis newspaper in 1899 and he and a brother “owned an abstract company, dealt in acreage and city lots, both in a large way, and built the first street railway in 1906.” They were active in the Baker’s Haulover area of Miami Beach, in addition to operating as the Miami Land & Development Company, which owned 35 sections of land east of Florida City and played an important role in the history of Florida City. They also operated the dredge that dug part of the canal from Miami up to Lake Okeechobee. The settling of the Homestead area, as well as the rest of Dade County, was a tale of rampant real estate speculation. Some were better than others at it and they became very wealthy. Others failed miserably. It is a twisted and tangled tale that will likely never be unraveled but I’m fascinated by it and will be posting more on the subject in the future.